<?xml:namespace prefix = st1 ns = "urn:schemas-microsoft-com:office:smarttags" />Toluca Lake Real Estate Homes is the perfect place to call your home. With many attractions just in or just minutes away, including Garry Marshall’s Falcon Theatre, the historic original Bob’s Big Boy drive-in, Warner Brothers Studios – where you can enjoy a true behind-the-scenes tour of a historic and famous studio, Universal Studios and Tour, Hollywood, Universal Studios City Walk and beautiful Griffith Park -–the largest urban park in the United States. Toluca Lake Real Estate Homes are centrally located and freeway close to all that Southern California has to offer. 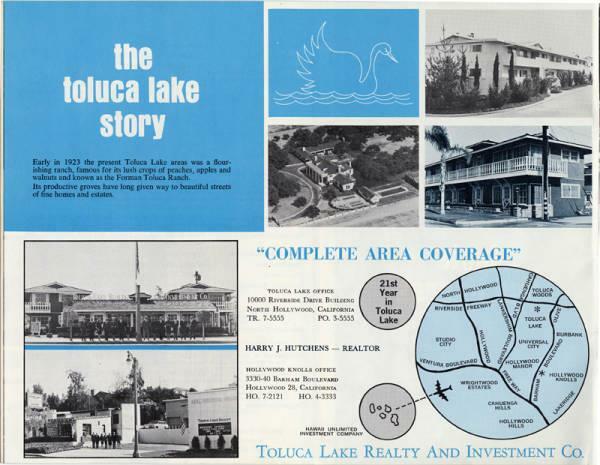 Toluca Lake Real Estate Homes is part of Los Angeles City as well as Burbank, CA. Toluca Lake is in the South East section of the San Fernando Valley and is close to Universal Studios, Warner Brothers Studios and NBC Studios. Toluca Lake Real Estate Homes Schools information can be found in the link below for Los Angeles City Schools. Depending on which part of Toluca Lake, CA. Real Estate Homes you are interested in, you might also check out the Schools information on the Burbank, CA Real Estate Homes section of this site. Toluca Lake is a wonderful place to buy Real Estate Homes. Please see our page "About Todd and Heather". If you own real estate in Toluca Lake Real Estate Homes that you're thinking of selling, I would be happy to provide you with a FREE Home Evaluation. Please browse our website for important information, including: Calculators (how much home can you afford? ), Buying and Selling tips, as well as Our Listings. Please contact us with your Toluca Lake Real Estate Homes needs. Thank you for visiting http://www.san-fernando-valley-real-estate-homes.com/Html/Toluca_Lake_Real_Estate_Homes/page_863592.html: The best source for Toluca Lake Real Estate Homes. The Value of Your Toluca Lake Home in 2 Eay Steps!